I went to Singapore for the first time during summer in 2008. Once my travel mate Shelly and I checked into the hotel Summerview, this transit ad right across the street caught my eyes. 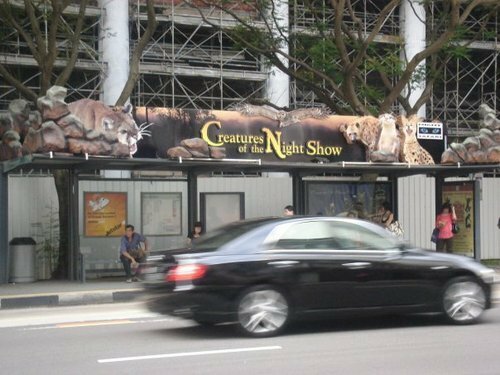 The ad was promoting the ‘Creature of the Night‘ show by the Night Safari, Singapore. More information was also available in the stack of pamphlets in the display racks dedicated to the interesting travel experiences in Singapore. Shelly said he had been to the Night Safaribefore and suggested that I should definitely check it out! This is the world’s first wildlife night park. The park is the winner of ‘Best Visitor Attraction Experience’, awarded by the Singapore Tourism Board. 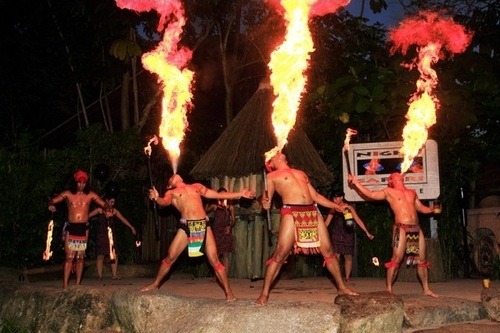 Singapore Night Safari has won this prestigious award 11 times! 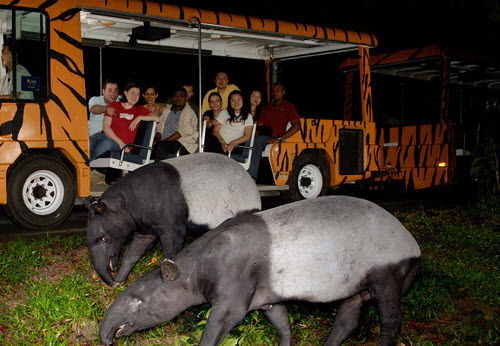 The highly popular Singapore Night Safari is right beside the Singapore Zoo. Electric trams take the visitors on an ‘atmospheric journey’ when touring through the jungle. The visitors are able to spot the nocturnal creatures in their natural habitat while the tram passes over the world of nocturnal creatures in their dimly-lit homes. There are over about 2,500 nocturnal animals of 120-130 species in this 40-hectare park. The park was opened in the year 1994 and among so many different species, this park hosts many wild animals indigenous to the region: Malayan Tapir, Malayan Tiger, and endangered Asian Elephant, etc. An electronic tram offers a trek through the jungle, on a 35-45 minute ride on its wheels. The live commentary takes the spectators across seven geographical zones of the world — from the ‘Rugged Himalayan Foothills’, ‘Asian Riverine Forests’, ‘Indian Subcontinent‘ to the ‘Swampy Banks of Equatorial Africa’. The guests are also offered an opportunity to trek through the jungle along the four walking trails if they are interested to take a look the animals up close and personal since these walking trails lead to the enclosures inaccessible by tram. Once we were on the tram, the commentator warned us not to use flash to grab any picture of the wild animals since doing so could disturb and infuriate them. When the tram crossed the swamp, she warned us to keep our feet inside the tram; otherwise it was dangerous since there were crocodiles in the swamp. Once the tram journey ended, we were taken to an open space in the jungle, and there was a spectacular stage there. This is where the ‘Creature of the Night Show‘ began that was hosted by the park rangers. The duration of the show was about 20 minutes to half an hour. The fire show was an interesting part of the show. One of the most thrilling item was a large python (the largest species of snake in the world) hidden under one of the enclosed sitting benches of the amphitheater! This wonderful ‘Creatures of the Night Show‘ presentation video was collected from the YouTube channel: Fie Miklo. Enjoy! unintentionally, and I am surprised why this twist of fate did not came about earlier! Hi! Please thank you cousin on my behalf! Hi! Currently I do not have any e-newsletter! You shall know if I have any! Thanks for subscribing to my rss feed. Really appreciate your time! Honestly speaking, I still have no idea! If I happen to get some in the future, I would surely let you know! Thanks for asking! of him as no one else realize such designated about my difficulty. Hi! I don’t think I know your cousin! But, it is nice of him to suggest this site to you! Thanks for your kind compliment! Thanks! Please also do thank your friends on my behalf! Yes, I have been using ‘Stop Spam Comments’ as a plugin. Do you have any suggestions? I tried to e-mail you but the mail got returned by the mail delivery subsystem. Cheers! Thanks for realizing that I in fact do put in a lot of effort for this. needed. I such a lot indisputably will make certain to do not fail to remember this web site and give it a glance on a relentless basis. you a shout out from Huffman Tx! Just wanted to say keep up the excellent job! for me. In my opinion, if all webmasters and bloggers made just right content material as you probably did, the web will be much more useful than ever before. Wow! What a compliment! Thank you so very much! It surely feels great to have such encouragement! God bless you! Thanks for your kind compliment! Feels really great! The theme was taken from the free template ‘Decode’ by Scott Smith. My best friend Shelly helped me with the theme selection. Hi! I would say follow your passion and write from your heart; not your head! However, it sometimes may feel overwhelming to maintain a blog. 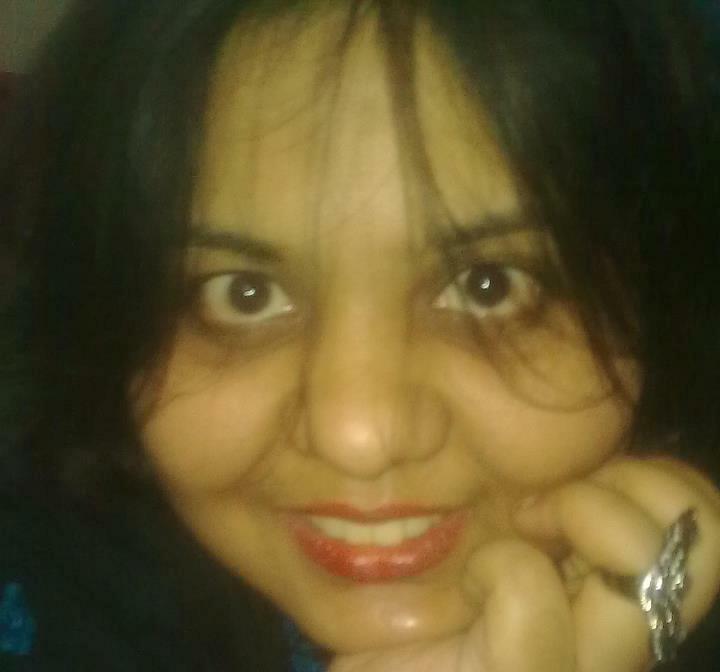 Nonetheless, if one could have the tenacity to survive this episode of stress with this daunting task and roller-coaster ride while keeping it cool; he/she would enjoy this habit of blogging! It feels really great to connect with your readers if your blog somehow goes viral! Best of luck! Hi! Sorry for my extremely delayed response. Currently I don’t have e-newsletter service. You may check out the FAQ section for rss feed subscription link. Thanks! Hi! You shall find your answers in the FAQ section of my blog. Hope that helps! Thank you for asking! FYI, till now I don’t have any e-newsletter. Once I do have the time to go for it, I’ll let you all know. Most welcome! Glad you liked it! Wow! Thank you so very much for sharing! I really appreciate it! Howdy! I just wish to give you a huge thumbs up for your great information you’ve got right here on this post. Hi! Thanks! I have jotted down all the answers to your questions in the FAQ section of my blog. Hope this helps! reading your article. But wanna remark on some general things, The web site style is ideal, the articles is really great : D.
No problem! Please go ahead! Thanks in advance for giving credit to my webpage! Hi! Thanks for your question. I’m afraid not. The details about the blogging platform that I have been using is outlined in the FAQ section of this blog. Hope this helps! Can I simply say what a relief to find somebody who truly understands what they are talking about over the internet. Hi! Thanks Would you mind telling me what are the spelling errors that you could find in the site? Would appreciate your getting back to me! Hi! Thanks! You shall get all the contact details on the FAQ section of this blog. Hope this helps! Thanks for your kind suggestions! Shall keep this in mind! Hello, this weekend is nice for me, as this occasion i am reading this wonderful informative article here at my home. I am moderately certain I’ll be informed lots of new stuff right right here! Thanks! I will, Lord willing! Thanks a million! You really made my day! Take care. I definitely really liked every little bit of it and i also have you book-marked to look at new stuff in your site. Thanks a million! I really appreciate! Most welcome! Please check out the FAQ section of this blog for the answers to your queries. bookmark your blog and check again here frequently. I am quite sure I will learn plenty of new stuff right here! what a information! existing here at this web site, thanks admin of this web page. Thank you so much for the idea! I really appreciate it!